A Silicon Valley startup says it's developed a better lens for smartphone photography -- one that produces clearer images without the distortion often seen in photos from competing lenses. The secret to DynaOptics' Oowa lens is a proprietary manufacturing process that produces what the company calls a freeform lens. 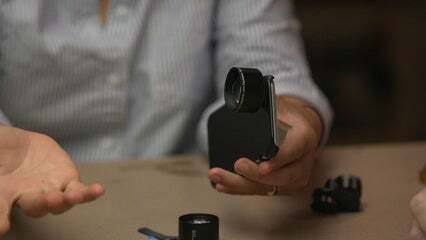 "What we are able to do with this freeform lens is essentially create a rectangular-like image so that it maps exactly onto the rectangular shape of the image sensor that's in the phone," DynaOptics CEO Li Han Chan said in an interview. Typical lenses produce a circle, which in many cases can cause distortion around the edges of images. The rectangular shape of the image coming out of the back of the Oowa lens means much less or no distortion. It all sounds a bit like snake oil, so I asked Chan to demonstrate it. She took handheld photographs of a target with three competing lenses - from left: a cheap $20 clip-on lens, the more expensive OlloClip lens, and a lens from Moment. Images taken with three competing lenses. It's immediately obvious that the $20 lens has some serious issues around the edge of the image, but zooming in reveals another problem. 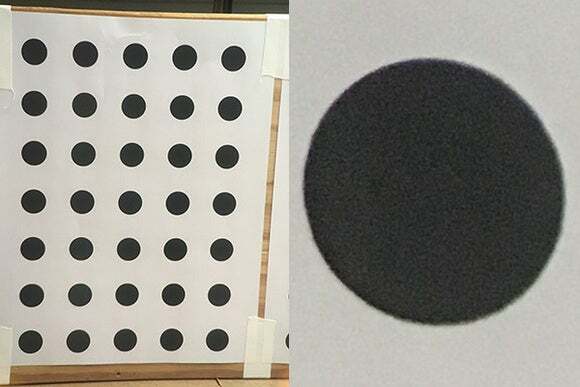 Close ups of the top left circle from each of the test images. These are zoomed-in images of the top-left dot from each of the full sheets. In the right-hand dot, the one taken with the Moment lens, you can see a little color aberration on the top -- that's the blue fringe. But overall, the Olloclip and Moment did much better than the cheap lens. An image taken with the Oowa lens. The picture from the Oowa lens was slightly better defined, at least to my eye, and it didn't suffer any color aberration. This isn't a conclusive lab test, but I tried it several times with Chan and the results were the same each time. Chan says that in everyday life the Oowa lens will mean cleaner, sharper pictures. The company is planning two lenses: a 2.5X zoom lens and a 15mm wide-angle lens. 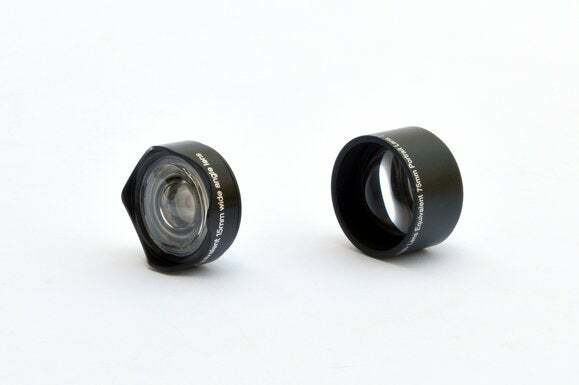 The Oowa lens set, shown with smartphones. Oowa is currently available on Kickstarter, where each lens with a phone case is promised for $79. The two lenses are promised in return for $120 or more. The lens is initially being offered for the iPhone 6 and iPhone 6S. Because it clips on to a case, it won't be available for every phone, but DynaOptics has pledged Android versions are coming.